Look at this gorgeous loaf of bread. We made that. Ed and I made this loaf of bread. Yeah, that's right, we're amazing. OK, so people have been making bread for thousands of years, but there aren't a lot of people these days making bread. And now, more than ever, I think I'm capable of anything. 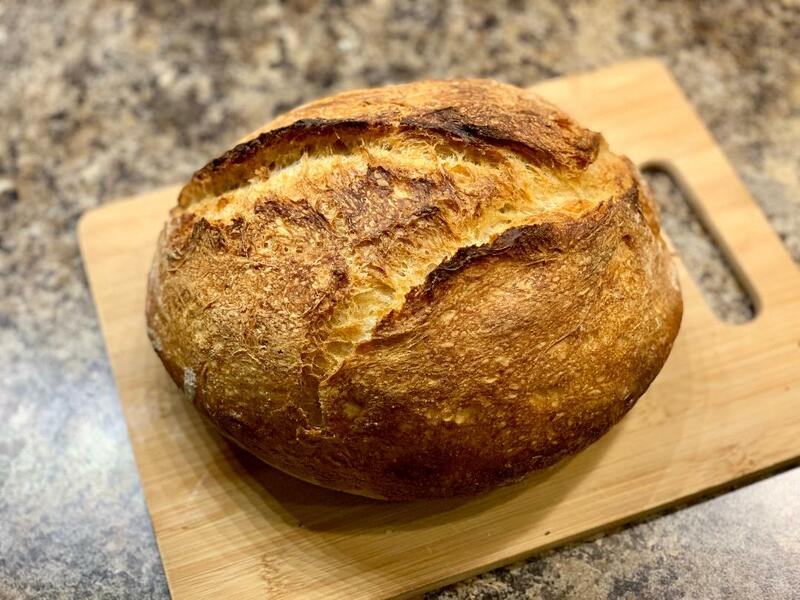 The recipe - Saturday White Bread - was taken from Ken Forkish’s book, Flour Water Yeast Salt: The Fundamentals of Artisan Bread and Pizza. 1,000 grams of flour, a little salt, a little yeast, and a bit of water and you've got the makings of a masterpiece. 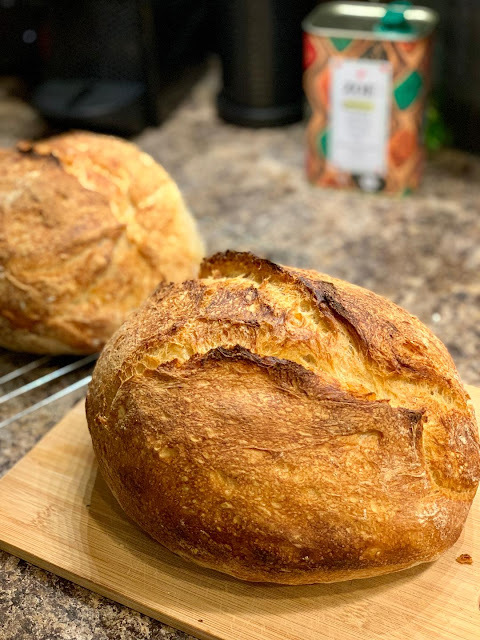 It was a time-consuming process - with more downtime waiting for the dough to rise than it took to mix the ingredients - but it wasn't difficult. We used my beautiful 15.5-quart oval Le Creuset Dutch Oven to bake both loaves at the same time - which was a judgment call on our part because the book specified two separate dutch ovens being used, a loaf in each one. We separated the loaves with a piece of aluminum foil so they wouldn't bake together, and it worked perfectly. This is the first time either of us has baked a loaf of bread and we were so excited by the result. The loaves were truly beautiful. BEA-U-TI-FUL. It smelled delicious while baking, and tasted amazing! We’ll definitely be doing this again. Head over to my Instagram account to see a few more photos and to watch the short video of Ed making the first slice in the bread. Be sure to turn up your volume - the sound of the crust is divine!